Mayor Bill de Blasio went on record last week bashing the Trump administration and the president in particular for his war against the free press, but his actions this weekend proved that he’s not interested in the free press as much as he likes to pretend. After a credentialed New York Post reporter tried to ask the mayor some questions at the Dominican Day Parade in Manhattan on Sunday, de Blasio stood by and watched dispassionately as security escorted the reporter away. Apparently the free press is only a good thing as long as they are hammering the president – NOT the liberal New York mayor. After de Blasio cut a ribbon to kick off the parade and was posing for photos near West 37th Street and Sixth Avenue, the reporter asked him to comment on the Page One “CITY FOR SALE” story. Of course, even before this disturbing incident, de Blasio admitted in plain English that he does not view ALL press the same way. In an interview with the UK Guardian last week, he mused on the fact that the world would be a much better place without Rupert Murdoch’s News Corp, which is the parent company of the Post as well as Fox News and the Daily Mail. He did this in practically the same breath that he assailed Trump’s “dangerous” rhetoric against the media. 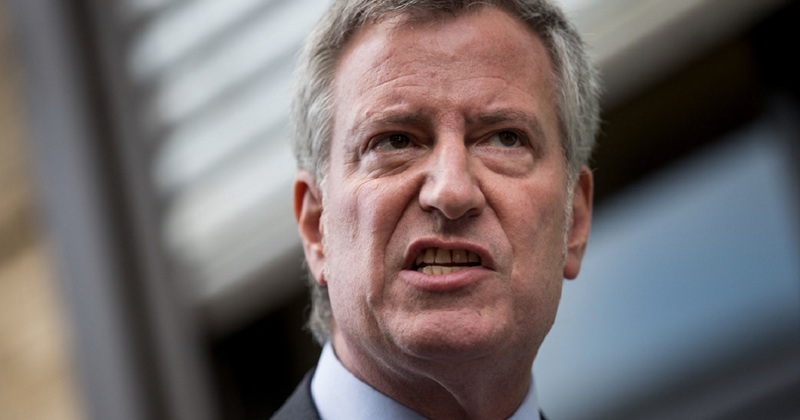 Apparently, in de Blasio’s diseased socialist mind, any news outlet that reports from a conservative point of view does not deserve the same constitutional protections as those that lie on the left.